More Americans are working remotely than ever before, and that number is growing every year. If you’re a part-time or full-time remote worker or freelancer, you’re going to rely on your computer to earn your money. 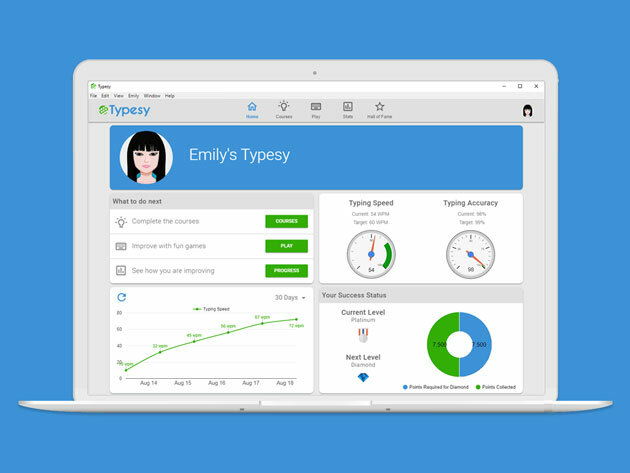 Typing faster allows you to take on more work for a robust bank account, and a lifetime subscription to Typsey can help you speed up your words per minute for a more efficient workday. Typsey is a typing training software developed by touch typing experts. It’s designed to take you from tortoise-level 50 words per minute to hare-worthy 100 words per minute. Hundreds of scientifically designed activities will help you master the home row while keeping things fun. Sixteen exercises help you identify typing weaknesses, so you can address and attack gaps in your skill set. If you hit a plateau when you’re working with Typsey, you can receive typing instructions from a personal coach to help you hit that next benchmark. When you’ve wrapped up your lessons with the program, you’ll receive an advanced typing certificate to add to your resume or LinkedIn page. It normally costs $290 for a lifetime subscription to Typesy, but you can improve your words per minute and watch your productivity skyrocket right now for just $19.99 (93% off).